The DVI-A analog configuration adapts an existing VGA cable for use with an analog DVI-I device. 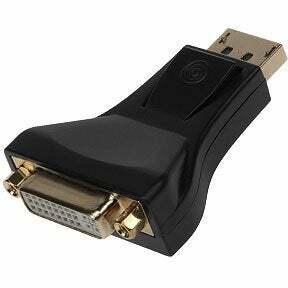 Use this adapter to change your VGA cable to have a DVI end. Convert a DVI Male to HDMI Male. 28 AWG and Fully molded and protect against unwanted EMI/RFI. Convert a HDMI Male to DVI Male. 28 AWG and Fully molded and protect against unwanted EMI/RFI. Designed to meet or exceed your highest high definition multimedia requirements. Convert a Display Port to DVI female. Convert a Display Port Male to HDMI female. Supports greater than 2048 x 1536 resolution at 24-bit color depths. The DisplayPort Female/Female Coupler lets you connect 2 displayport cables together. Connect a DVI-Dand DVI-I display to a DisplayPort video source (e.g.DisplayPort video cards, etc. ), eliminating the expense of having to upgrade to a DisplayPort capable display. DisplayPort (DP) to VGA Cable Converter Adapter With Latch Male-Female Black. Active adapter with build-in chip. SFCable has a collection of various DVI/Displayport Adapters available in various series and combinations. Convert from DVI/Displayport to VGA, HDMI, Mini-Display and vice versa. You can choose from multiple product varieties including dual link splitter cable, male analog to female adapter, dual link to DVI adapters, female analog to male adapter, a series of male port to female adapter cables, video adapters, couplers, and different combinations of DVI to adapter connections. All our products are RoHS compliant and environment friendly without affecting its functionality and quality. We are known in the market for providing unmatched after sale services along with lifetime technical support. And most importantly, you get all this at a very reasonable and discounted price.